Charleston is one of the oldest, most storied cities in America and has developed a rich culture shaped by a number of historic events (the Civil War commenced at Fort Sumter, for one) with distinct geographic elements (the city is flanked by two rivers and a beautiful harbor on the Southern tip). And due to its small size, you’ll inevitably stumble on significant sites and the picturesque Charleston single houses, with their piazzas and lace-like facades, simply by taking a post-dinner walk. What’s more, many of the newer restaurants, bars, and shops are housed in old buildings that have been beautifully converted to accommodate modern-day needs—though they still retain the old-world charm that makes Charleston so unforgettable. History permeates almost every aspect of the city, from the majestic homes-turned-museums to the landmarks that promote the city’s role in United States history. Civil War buffs should head to Fort Sumter, where the first shot of the War between the States was fired. Meanwhile, shopaholics looking for locally made goods should peruse the Charleston City Market. When you’re ready for a day at the beach, the city’s got you covered there, too. Several beach towns, including Sullivan’s Island, Isle of Palm and Folly Beach, offer sun, sand and gentle waves. Continue reading our Charleston Travel Guide and start planning your Charleston vacation today! For more great East Coast beaches of the U.S., visit our Best East Coast Beaches review here. The best time to visit Charleston is from March to May or from September to November when temperatures are mild – but not stifling. Hotel rates, however, will be high, especially around Easter. Also, the city will be thick with crowds “ooh-ing” and “ahh-ing” at the blooming magnolia trees, the Southern fried food and their tour guide’s ghost stories. Steer clear of high prices and tourist swarms by visiting in the late fall or early winter. Temperate weather accompanies blooming trees and flowers, making spring one of the best times to vacation in Charleston. The warm 60 to 80-degree temperatures usher in a colorful array of blooms throughout the city, which you can tour during the annual Festival of Houses and Gardens. But you won’t be alone in a springtime visit: Prepare for high hotel rates and hordes of tourists competing for lodging space, especially around the Easter holidays. Avoid the large crowds and steep rates with a mid-week visit instead of a weekend stay. The best way to get around Charleston is on foot. You’ll probably enjoy the use of a car too. You can rent a car at Charleston International Airport or bring your own and leave it parked in one of the garages located throughout the city. Having a car is especially helpful if you’re staying in the city outskirts or if you plan on indulging in some beach time. City buses and trolleys are available too, as are taxis. From the airport, which is located about 12 miles northwest of the downtown area, you can take a cab or shuttle bus. Taxis from the airport to Charleston’s downtown area cost about $29 to $34, depending on where your hotel is located. Shuttle buses depart every 15 minutes and cost $14 per person. The price is lower than a taxi ride, but the trip will be longer due to the multiple stops the bus makes. With its centuries-old mansion and cobblestone streets, Charleston is like a living museum. One of the best ways to learn about its history (and its ghosts) and the significance of its best-known landmarks is on a walking tour. There are a variety of options available, ranging from broad tours of the city’s historic downtown district, to more niche tours that explore the city’s paranormal presence, pirates and art galleries and studios. Visitors have praised operators like Charleston Footprints, Oyster Point Historic Walking Tours and Two Sisters Tours. To see a more complete directory of available walking tours, check out the Charleston Convention & Visitors Bureau’s website. This row of Southern-style mansions overlooking Charleston Harbor was formerly the heart and soul of the city’s maritime activity. Today, the area attracts camera-toting tourists from all over the country. This is a must while in Charleston. As you explore this picturesque neighborhood, make sure to also spend some time in the nearby White Point Gardens, where several Civil War relics and memorials commemorate the city’s role in the battle. 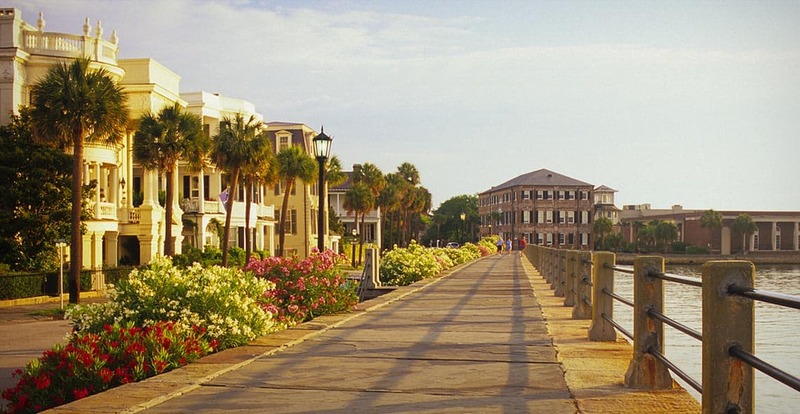 Start your tour of the Battery at the 12-acre Waterfront Park (home to the giant pineapple fountain featured on many Charleston postcards), then follow the walking paths on East Battery Street for the nearly mile-long stroll to White Point Gardens. If there were ever a place to stop and smell the roses, this house would be it. Built in 1755, this mansion was once the home of Arthur Middleton, one of the signers of the Declaration of Independence. Today, Middleton Place houses an impressive collection of historic furniture and portraits (all originally owned by the Middleton family), plus a stable with heritage-bred animals. Visitors can also watch historical re-enact the skills and technology used on an 18th-century plantation, or take a carriage or specialized tour. Just make sure you save time to treat yourself to a bite to eat at the Middleton Place Restaurant, where the menu is inspired by traditional low country Gullah cuisine. Constructed at the turn of the 19th century by Nathaniel Russell – a wealthy Southern merchant – this historic home is best known for its magnificent spiraling staircase, detailed furnishings and landscaped gardens. Unlike the Aiken-Rhett House, the Nathaniel Russell House has undergone an architectural and interior restoration. This is the place to go if you’re looking for insight into the more lavish side of Southern comfort. Tours, which last approximately half an hour, are docent-led and commence every 30 minutes. During the tour, you’ll learn about the Russell family and the slaves who cared for the home. According to many, there’s no better example of antebellum life than the Aiken-Rhett House Museum. Originally built in the early 1800s and then expanded by Gov. William Aiken and his wife in the 1850s, much of the house’s original style has been preserved. As you wander through, pay special attention to the antique furnishings, the original wallpaper and the stunning bronze chandeliers installed by the Aikens. Also, spend some time exploring the grounds: You can visit the slave quarters, the stables and the kitchens, all of which have been preserved to satisfy any history buffs yearning for a taste of the Old South. Sail year round on Charleston’s finest, private, and romantic 50ft luxury yachts, “Fate” and “Kismet”. Rated by Forbes as one of the top romantic things to do in Charleston! 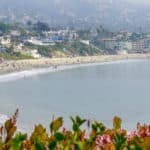 Enjoy the sights of this beautiful city from historical landmarks to a wide variety of wildlife as you relax and feel the ocean breeze, all while your professional captain and mate cater to your every need. Available for hourly, daily and overnight adventures. For more information call +1 843-557-7403, or visit them on the web at Charleston Sailing Charters. Coastal Expeditions’ mission is to take people to beautiful places to experience meaningful things by kayak, SUP, canoe and powerboat. Founded in 1992, Coastal Expeditions is the original outfitter in Charleston, South Carolina and is a family business with a team of exceptional, big-hearted guides. Saltwater and blackwater tours and rentals are available year round from several wildlife-laden spots, including 4 private on-water outposts at Folly, Shem Creek, Isle of Palms and the Bulls Island Ferry. For more information call +1 843-884-7684, or visit them on the web at Coastal Expeditions. Family fun for everyone! They offer 3 hour shell and sharks tooth hunting & history trips out to beautiful and secluded Morris Island, as well as romantic sunset and dolphin cruises. Science and eco tours for kids, and school groups that meet or exceed SC school standards as well. Definitely kid and pet friendly, too. For more information call +1 843-442-9455, or visit them on the web at Adventure Harbor Tours. COA provides clients the opportunity to explore the saltwater estuaries through guided kayak tours, guided paddle board tours, charter boat tours, inshore fishing charters and kayak &paddle board rentals. With COA, you can expect to experience the Lowcountry in a way you will never forget. Their trips focus on natural, scenic and cultural areas that are not impacted by industrial tourism. For more information call +1 843-795-0330, or visit them on the web at Charleston Outdoor Adventures. They offer access to some of the most scenic waterways in the Charleston area. Naturalist guided kayak tours and rentals are offered year-round from the grounds of historic Middleton Place. Immerse yourself in the rich history, ecology, and protected waterways surrounding this National Historic Landmark site. Tours are suitable for any skill level or experience. If your more comfortable with an engine, join one of their history and dolphin boat tours exploring the salt marshes aboard our 24ft Carolina Skiff. For more information call +1 843-628-2879, or visit them on the web at Charleston Kayak Company. Chef Sean Brock’s testament to new southern cuisine, Husk sources heirloom grains, heritage animals, and classic Lowcountry produce both from area farms and from its garden. The menu changes regularly, but the dinner rolls are a constant, sprinkled with benne seeds and bourbon-barrel-smoked salt, served in a locally crafted sweetgrass basket with pork-infused butter for dredging. For more information call +1 843-577-2500, or visit them on the web at Husk. Old enough to be considered an institution, but still creative enough to wow the locals who have favored it for years, Fig is one of Charleston’s biggest success stories. Owned by Mike Lata, the kitchen is run by James Beard winner Jason Stanhope, who brings his South American background and French technique to Southern cuisine, creating dishes like fish stew provencal, made with locally caught white shrimp, squid, mussels, and Carolina gold rice. For more information call +1 843-805-5900, or visit them on the web at Fig. Housed in a 1920s bank building, the high ceilings and expansive room—designed with clean white tile and black wood accents—is elegant in a simple, Parisian cafe sort of way. The website says “fancy seafood,” and this is the place for it in the city. Don’t miss: oysters on the half shell, crudo, the lobster roll, or the crispy oyster slider, since it’s something that most people who frequent get every time, no matter the choices for the rest of the meal. This bar has an impressive collection of rum, so the cocktail list is divided into “With Rum” and “Without Rum” categories, with 12 in the former. For more information call +1 843-414-7060, or visit them on the web at The Ordinary. For a taste of something outside of fried green tomatoes and sweet tea, head to Xiao Bao Biscuit on the corner of Rutledge Ave and Spring Street. Here you’ll find a beautiful marriage of Asian and Chinese soul food, with spicy dishes like Thai yellow curry with mung bean cakes, Japanese cabbage pancakes with pork “candy,” or local snapper prepared with Chinese spices and seasoned greens. Inside a converted gas station, it’s popular for business and casual meals among the creative class. For more information visit them on the web at Xiao Bao Biscuit. What is so beautiful about this restaurant is that it is Italian and Charleston at the same time, a bit like a rambling Italian seaside restaurant tucked just a block off King Street. Although firmly in the “tourist district,” it is still firmly a neighborhood spot. You can pop in for a happy hour bite of fried mozzarella sticks, enjoy a plate of rigatoni verde and a glass of wine at the bar, or go all out with courses and spend the evening there. Standouts include the Fideos with toasted angel hair pasta and local shrimp, a filling Warm Rosemary Focaccia served with whipped ricotta, anything from the excellent vegetable selections, and Octopus Carpaccio, a fan favorite. For more information call +1 843-212-0920, or visit them on the web at Le Farfalle. The Cocktail Club mixes up some of the most creative “farm-to-shaker” cocktails in town using house-made infusions, syrups, spices, roots, shrubs, bitters, herbs, and rare spirits. For more information call +1 843-724-9411, or visit them on the web at The Cocktail Club. In addition to dancing, many come here for infused craft cocktails, an impressive whiskey selection, seasonal beers on draft, and elevated edibles such as squid and grits and maple-bourbon hot wings. For more information call +1 843-793-2964, or visit them on the web at The Prohibition. An intimate nook, Proof fills with craft cocktail connoisseurs escaping the collegiate pub crawl. For more information call +1 843-793-1422, or visit them on the web at Proof. A classy evening and late-night cocktail lounge with towering pressed tin ceilings and black-and-white movies projected on a rear screen, The Belmont maintains a vintage vibe and devoted following. For more information visit them on the web at The Belmont. Next door to uber-trending restaurant Husk, the freestanding Bar at Husk is a destination in itself, thanks to an impressive drink menu. For more information call +1 843-577-2500, or visit them on the web at The Bar at Husk. Experience America’s favorite city through the lens of John Dewberry, preservationist and proud Charlestonian. 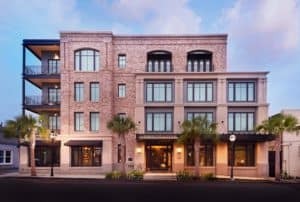 At The Dewberry, sincerity outshines obligation and every element is specifically designed to deliver luxury, warmth and a nod to old Charleston. 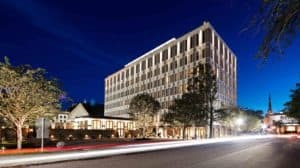 Conde Nast Traveler 2019 Gold List Hotel. For more information, pricing, or to reserve your room visit The Dewberry Charleston. 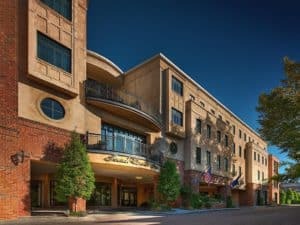 A hidden gem tucked just off Market Street in downtown Charleston, The French Quarter Inn is an intimate boutique hotel with a singular calling: to make you feel at home. 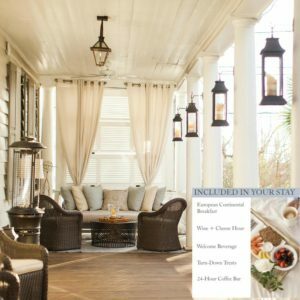 Regularly ranked among the city’s most luxurious retreats, it captivates guests with an experience akin to visiting the gracious Charleston home of a charming Southern friend. For more information, pricing, or to reserve your room visit French Quarter Inn. A 21-room tribute to Charleston’s gilded age, the historic Wentworth Mansion exudes the glamour and grandeur of the Holy City. Italian crystal chandeliers, hand-carved marble fireplaces, and Tiffany stained glass create a setting of gracious hospitality, further enhanced by luxurious amenities and thoughtful guest experiences – all just a short stroll from King Street’s world-class dining and shopping. 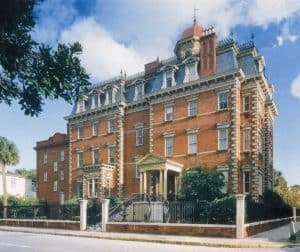 For more information, pricing, or to reserve your room visit Wentworth Mansion. A Travel & Leisure World’s Best Award. Offering the best address in Charleston’s bustling historic district, The Spectator Hotel evokes the exuberance of the Jazz Age and the genteel glamour of the Old South. Step inside our sleek boutique and discover why we’re #1 in Charleston, #2 in the U.S. and #61 in the world as voted by Travel + Leisure readers. For more information, pricing, or to reserve your room visit The Spectator Hotel. Zero George’s immaculately restored circa 1804 buildings and private courtyard are the ideal ground zero for exploring Charleston’s allure. Award-winning luxury boutique hotel featuring contemporary design, Zero Restaurant + Bar, cooking school, concierge, and custom bicycles. Hospitality refined, down to Zero. For more information, pricing, or to reserve your room visit Zero George Street. The architecture looks incredible! I love a vintage vibe and the origins of things, and the Aiken-Rhett House Museum looks absolutely amazing and chalk full of interesting historical knowledge to absorb. I never really had Charleston on the radar as a place to visit before reading this page and now I am super eager to dial in an adventure down this way. The content is vast, informative and clearly delineated which takes the overwhelm that is sometimes felt when venturing out on a new adventure. Very empowering to have all this knowledge at my disposal. Thank you Leahrae! You are so welcome Bex! I am glad you enjoyed your digital visit to Charleston. I have to agree that it is a pretty amazing place with so much. Thanks for the visit as always! I never have been to the Southern States and the city of Charleston certainly is very intriguing to spend a visit. I have read in the past about its history and I always felt a pull to get there. I appreciate all the detailed information you have provided in your article like the best time to visit and what can be expected. I have saved your article to get to it when the time is decided when to travel. You are very welcome Sylvia, and when you are ready to start planning, just let me know. I would love to help! I really can’t wait to visit this very detailed historical magnificent structures in the city of America. The Charleston area has so much historical events to visit. Indeed it’s worth visiting. I so much love the Charleston attractions but the very one that I am looking forward to is Middleton Place. Ohh, Middleton is so beautiful. The only challenge for now is just that the hotels are expensive, but I am planning and saving for it! Yes, tons of history and tons of beauty. I hope you can vacation to wonderful Charleston soon. Please let me know if I can help in any way or answer any questions. Thanks for writing this Charleston travel guide, as I’ve always wanted to visit this city which is the oldest and biggest city in the U.S. Taking walks around and learning about the history of this great city has me dreaming of Charleston! I am planning to go towards the end of the year when I will be able to take off from work. Looking forward to a good experience. I think it will be an amazing experience! Please let me know if you need any additional information, or help with planning your Charleston vacation. My problem with travel is that, even if the place is beautiful and affordable, I prefer not to go unless there is family close in the area that I could stay with in case things don’t go fubar, like if a hurricane hits. And while it’s close to Florida on the full scale, it’s not close enough in relative distance. Maybe I’ll grow past this little attribute of mine when I start travelling more. But that’s how it is for now. Well, I do hope you can get past it. If you don’t travel during hurricane season, and you also keep a watch on the weather, you won’t have any issues. I live in Florida, and I have lived thru two hurricanes (I moved here just 2 years ago! ), but the National Weather Service is very good at letting us know when one is coming. I am so glad I found this website! 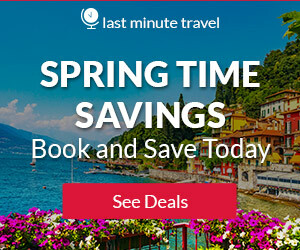 I am planning a trip to Florida in March and by using the Easy Click Travel, I found hotels listed that were not found on other travel sites and I will be able to save over $30 per night. Before I book though, I am going to try the other recommended negotiating tips directly with the hotel 1st. Great Paul! You can also shoot me an email at leahrae@beachtraveldestinations.com with your travel particulars, and I can help you find the best deal. Thanks for visit my Charleston Travel Guide. As a eleven-year-old, myself and my sister were lucky enough to be taken on a month trip around America by my parents, as my dad had retired young from being a dentist (football injury). Funnily enough, one of the last destinations on that wonderful holiday was Charleston, and I seem to remember a horse drawn tourist ‘bus’ journey we took. I’m wondering if they still have these types of ‘horse’ tourist vehicles around the area now? I do believe they do have the horse drawn carriages there! That is pretty cool you have such fond memories of Charleston. It really is a great beach community. Thanks for stopping by. 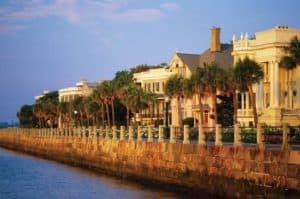 Thanks for this great write-up on Charleston, you have made me realize a very cool place to visit on vacation some days. I will also love you to write a review on Santorini, I heard they have got great views and sights to behold. You’ve really done a good job on this article. Thanks so much and Santorini is wonderful. I have actually written a review that included Santorini, but I need to cover it exclusively, as it is one of those great bucket list items. Yes, I think September or October would be my perfect time to visit Charleston. You’re right, you don’t want to be sweating to death; it would be so much more enjoyable to visit during the cooler weather. I also like going on vacation after the kids go back to school. I know some people with children in school would be forced to go during their breaks, but that is not my situation, so I have the luxury of missing the crowds. 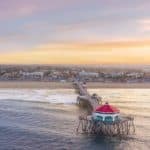 Great article on this quaint and beautiful city. Thanks for all the info! Really helpful! You are very welcome Babsie, glad you enjoyed! 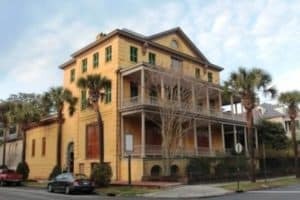 An excellent guide to travel to Charleston, thank you! We are planning a trip there with the whole family, and we didn’t really know what activities to do once will get there. After reading your article, I am convinced we won’t be able to participate in all these activities. We need to choose some of them. I really like the Charleston sailing charters and kayak company tour. Now for the hotel, I still didn’t make my mind up. Is there a hotel you have already tried and that you would suggest? I mean which of these would be the best? I’ve actually been to Charleston but not for a long time now and not for an extended visit. This is a beautiful city and I love South Carolina. We’ve actually been planning a trip north to the area. We’re history buffs and will enjoy going there only this time we will stay longer and get to see more of Charleston. The coastal expeditions and harbor tours will be on our list for sure! There sure is plenty to see and to do in Charleston! We were going to wait until autumn but I think we’re going sooner now! 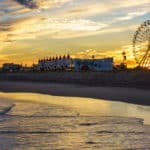 Thanks for a great write up on such an awesome place to visit! You are very welcome Rob! I am excited for you as Charleston is a wonderful coastal community. Thanks for stopping by! Wao what a wonderful post with lots of beautiful, colourful pictures and detailed information. Actually I love historic places and after reading your post I can’t stop myself for being there. Hope I visit there someday. Thanks for sharing such informative post. Keep up the good work. Wow its so amazing photos of this place.Hoping we already can visited this in a future. Charleston is a wonderful East Coast beach community. It has so much to offer besides just beautiful beaches. Thanks for reading my Charleston Travel Guide. What a beautiful, historic city. I did not realize that there was so much to do there. It sounds like a wonderful place. Sadly, I have never been to South Carolina but it is on my list of states to go to in the very near future. There are a lot of people from my state moving there and I have heard that they love it. I really like that most of the things to do there are outside. Sounds like a vacation I’m going to have to book in the future. Thank you for the great information! You are right! It is a beautiful historic city. 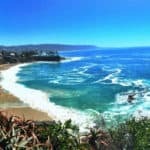 Not only do they have great beaches, they have so much more. A little for every one actually. So for beach travel, I think it is a definite bucket list item. Thanks for stopping by. Hi Leahrae, thank you for sharing Charleston… I am so glad I came across your site. When I landed on this page and saw the beautiful photo of Charleston I immediately fell in love with Charleston. The town is so picturesque and looks “Classy”. The kind of place I would love to visit. You are very welcome Moni! I had not thought of Charleston as being classy, but now that I think about it, yes it is classy! I love a good beach town with good food, shopping and things to do besides just relaxing at the beach. Charleston has it all. Thanks for reading! As usual, you always pick the most attractive locations. You’re doing a great job Leahrae. Thank you Pearl and thank you for your support! I have been an explorer lately and in constant search for new places to travel. Charleston seems to be a place I would enjoy the most. I love how you have provided all the information about the place. This satisfied all the queries I had. Middleton Place seems mesmerizing. Oh Middleton Place is a must when you head to Charleston. So beautiful, just like the whole area. Glad you enjoyed reading and learning with my Charleston Travel Guide. Thanks for stopping by. Several years ago we visited Charleston and after reading this article want to return. Lots of neat places we missed and now we have the time to go and visit for an extended time (not a short vacation). A lot of Charleston we did not get to enjoy because we were not prepared with a plan of what there was to see, Going to Charleston was sort of a last minute decision. I can tell you his will be added to travel folder for when we get to go back. Great Barry, there really is a lot to see. For me the tough choice is the hotel. There are so many wonderful historic hotels there. Makes the decision very tough, except that I just have to keep going back! Another great read, it’s like I’m there! Now I want to go.. well played 😉 Definitely looking to plan a beach vacation to Charleston! Awesome, please let me know if you need any additional information. This is very well put together, no lack of information. Looks like a beautiful place to visit, maybe i’ll get there someday. Thank you Amanda for stopping by and taking the time to comment.